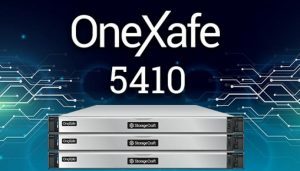 StorageCraft has launch three OneXafe SKUs to choose from: the all-flash OneXafe 5410, which is optimized for server virtualization, VDI, and other high-performance use cases, and the slower but more affordable OneXafe 4412 and 4417, which are designed for use as unstructured data archives and video storehouses. StorageCraft will add further OneXafe SKUs within roughly the next six months. Pricing on the OneXafe 5410 starts under $30,000. The OneXafe 4412 and 4417 list at $14,000 and up. Buyers must pay for OneXafe hardware upfront, but can buy the other elements of the product either on a subscription basis or via perpetual licensing. ShadowXafe offers subscription-based and perpetual licensing as well. Going forward, StorageCraft will position ShadowXafe as the platform of choice for businesses at the smaller end of the SMB scale and encourage larger SMBs to buy OneXafe. “ShadowXafe is an ideal solution for company with between tens to hundreds of VMs and machines that need to be protected, while mid-size companies with VM counts in the high hundreds will be better served by OneXafe appliances,” a spokesman said. OneXafe is but the latest StorageCraft solution to utilize OneBlox arrays.